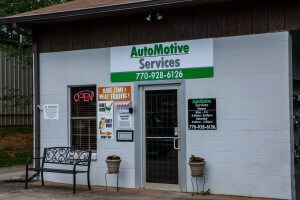 OIL CHANGES: We normally use 5W30 which is a Semi-Synthetic oil and perfect for most vehicles. A new oil filter is included. Most vehicles take between 4-6 quarts of oil and price ranges $24-$28 with tax included. A FREE Multi-point inspection is included as well to help you plan and budget for any future repairs you may need to keep your car running smoothly and safely. BRAKE JOBS: $165. This includes replacing Front or Rear pads, shoes and machining rotors. If rotors are unable to be turned, then they are $120 for both. CHECK ENGINE LIGHT ON: We have the technical capabilities needed to determine why your check engine light is on. We will run the codes on your car with our computer and give you an estimate for free in most cases. We will NEVER charge you for something unless we first get authorization from you to do the work. A/C REPAIRS: Drain, evacuate and recharge system. $105 plus refridgerant cost. A/C Diagnostic: $18. Basic A/C check-up. Check hoses, etc. PRE-PURCHASE USED CAR INSPECTIONS: $ 80. We will check your vehicle over “bumper to bumper” and let you know any repairs it needs as well as the condition of the vehicle itself. We can help you to make an educated decision and feel good about purchasing a used vehicle. We can also give our recommendation as to whether or not we would think it to be a good purchase.